These three women represent a fraction of a population that’s not going away—older adults who are discriminated against at work, marginalized in our culture, and made invisible by politicians and the media alike. While lacking a catalytic event like the horror of Parkland or the murder of Michael Brown that crystallized awareness of underlying systemic abuses, the fight for age justice is just as real as other social movements seeking societal change. This is why the Radical Age Movement is organizing the first ever Age Justice Rally in NYC on May 15th in Union Square Park. Like the students seeking new gun laws and the activists of Black Lives Matter demanding an end to racist policing, we older adults fighting for age justice aren’t going anywhere: We’re part of the future too! What is age justice? Age justice is a movement for the societal recognition of the power of older adults, seeking to maximize our skills and desire to keep contributing. In a twist of our generation’s slogan , “we seek to be part of the solution, not the problem”. Why name ourselves the Radical Age Movement? Because fighting how older adults are marginalized is ripe to explode into movement activism. Old age is a time of opportunity that brings together a diversity of life experiences. All too many older adults—especially immigrants, people of color, women, and LGBT folk—have faced oppression and discrimination over their lifetime. Others only begin to feel the pain of discrimination and invisibility as they grow old. Together we share the harshness of ageism. Older adults in the 21st century should be seen as a success story. We have opened up a new stage of life along the life span. People who are between age 55 and 80 and relatively healthy are not ready to pack it in! We are not inclined to “retire”, nor can we afford to be unemployed. We are staying healthier longer. Health issues that may have impacted our parents at 75 may not impact us until 85. Yet, many of us are discarded, beginning in our 50’s. Our demands start with ending rampant age discrimination in the workplace. As “Pro Publica” reported, IBM laid off 20,000 employees, the majority age 50+. If you’re deemed too old, you’ll likely not see certain job postings on Facebook. Employers blatantly seek “digital natives”, a person born during the age of digital technology.As at our wine and cheese fest, too many older workers reported that “the workplace has written me off”. Let’s be clear: Aging is an issue for women, for communities of color, immigrants, the under- and unemployed, and those desperate for affordable housing. Ageism soon may be affecting you: Over 2.6 million NYC residents are over 50. The attitude seems to be that we won’t be around much longer and thus can be ignored. Yet older people are the fastest growing demographic. We are part of the future too! Ageism may be less openly violent, but it still kills. Researchers have found that people who are exposed to negative stereotypes of older adults die an average of eight years earlier than those who are exposed to positive images of growing old. We are short-changed, too. Social Security once included cost of living increases based on actual inflation. In 2017, there was an increase of but $2 per month—followed by Medicare’s far larger increases. Frighteningly, Congress wants to cut more. What can we do to confront age prejudice? Some of us were the radicals of the sixties. Then we used our voices to wake up the country and helped build movements for civil rights, anti-war, women’s and workers’ rights. Today, we are over sixty; it’s time for us to wake up our fellow Americans again. Everyone wants to live forever, yet nobody wants to grow old. Young people who are “woke” know that if they harbor disdain towards old people, they are setting in motion a prejudice against their future selves. Old people are not the other; we are part of the same humanity as everyone else. Old age is not an illness. It is a natural part of the life course to be embraced. Imagine if everyone, young and old alike, came together to protest the way older adults are treated. What a movement that would be! If we don’t, then everyone will age at their own peril. So, today we are asking you to become warriors in the fight for Age Justice that is sorely needed to create a multi-cultural, intergenerational, age-inclusive society. Be a part of history! Join us at the first ever Age Justice Rally, NYC, Tuesday, May 15th, 4:30-6:30, Union Square. Alice Fisher is founder and Bobbie Sackman a steering committee member, Radical Age Movement. 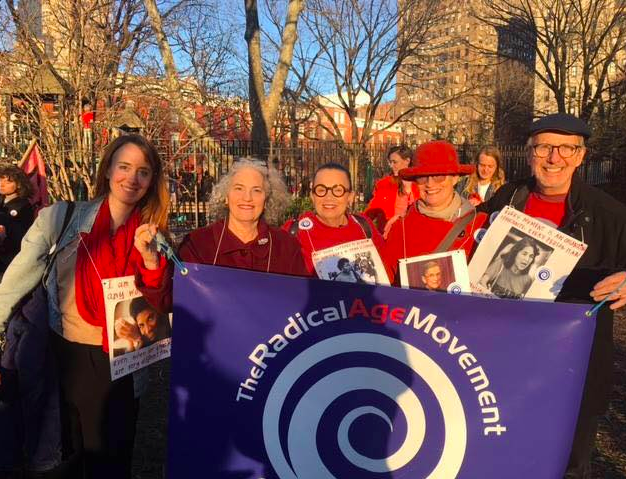 The Radical Age Movement is a national non-profit based in New York City that rejects long-standing misinterpretations of aging. Our goal is to end these forms of discrimination and bias toward aging so that all generations may live productively and well throughout the age span. For more information, go to www.radicalagemovement.org. The authors thank Steve Burghardt for his comments on the op-ed. My name is LaVerne Freeman Martins and I live in Boston, MA and I am and have been a victim of age discrimination more than once on a job. For 20 years I owned an employment agency and I know a ton of people old an not so old. I am lucky that I don’t look my age, I don’t act my age and I have stayed on top of the industry and unemployment in MA is 3.4 so I am needed as a recruiter in the Healthcare industry. But the problem is I like to do contract work. I sold my business 2o years ago and traveled but all of my friends were still working and I was divorced so I went back to work. When I work for women in the age group of 42 to 48 they immediately think that I want their job and thus the harassment begins. You would not believe the things they try to do to me.i have been to the EEOC twice and won Twice. I didcnot know that people could be so mean. New York state’s prison population is getting smaller. It is also getting older.